للمسافرين الذين يرغبون أن يعيشو كل ما تقدمه سيدني, فندق مانترا باراماتا هو الخيار الأمثل. يسهل الوصول إلى هذا الفندق ذو 4.5 نجوم من المطار، فهو يبعد عنه مسافة 45.Km فقط. يضفي محيط الفندق اللطيف وقربه من Parramatta District, Argyle Street Medical Centre, Westfield Parramatta Shopping Centre سحراً خاصاً على هذا الفندق. إن الخدمات التي يقدمها فندق مانترا باراماتا تضمن للنزلاء إقامة مريحة. تتضمن الميزات الرئيسية في هذا الفندق: خدمة الغرف على مدار الساعة, مكتب الاستقبال على مدار الساعة, مرافق مخصصة لذوي الاحتياجات الخاصة, تسجيل وصول/خروج سريع, تخزين الأمتعة. يمكن للنزلاء الاختيار من ضمن مجموعة من الغرف المصممة بعناية لتعكس جواً من الراحة، والتي يتجاوز عددها 228. سواء كنت من محبي الرياضة أو كنت تتطلع لتفريغ عناء نهار صعب، ستجد خدمات ذات مستوى عالي بانتظارك كمثل حوض استحمام ساخن, مركز للياقة البدنية, ساونا, مسار جولف - ضمن 3 كم, حمام سباحة خارجي. مهما كانت أسبابك لزيارة سيدني، فإن فندق مانترا باراماتا هو الخيار الأفضل لإقامة مثيرة وممتعة. جميع النزلاء الذين تقل أعمارهم عن 18 عامًا يجب أن يكونوا بصحبة الوالدين أو الوصي القانوني. يحق للعقار رفض أي حجز إذا لم يتمكن الوصيّ القانوني -أكبر من 18 عامًا- تقديم بطاقة هوية سارية أو دليل على الوصاية القانونية في حالة طلبها عند تسجيل الوصول. Great hotel for its value, nothing wrong whatsoever. Only reason I havent put 5 for cleanliness is because there were breakfast trays from next doors in the hallway til at least late in the evening and probably the morning. It was surprising as the cleaners definitely went around cleaning the rooms and saw these trays. Not a biggy, just detail to be picky on something. Hotel located very near to Parramatta train station and Westfield shopping center that provide various of foods, restaurants and supermarkets. It's very convenient in this area. The room is spacious with good view (our windows is facing to Deloitte building), bed is comfort, hot shower with bathtub, wifi is good (upon joining their Mantra membership free), great customer service with surprise compliment red wine! Helpful staff, though tiny room and wouldn't recommend paying for there carpark, so tiny especially if you have a larger vehicle, its easily full with limited spaces, if its full you havd to park on the street even though you paid for parking. I got the room on a special low rate and it was amazing. Perfect place to stay in Sydney's west. Everything was great and the bed was just amazing. Walk all around Parramatta with easy. At the discount rate I will stay there everytime. I just loved it. good hotel. complete ammenities - kitchen, laundry but the internet was bad. it was constantly disconnecting and if you're not a mantra+ member, you have to pay it. If you become a member they give you 5GB for my 5 day stay. But it was a great hotel.... close to subway. 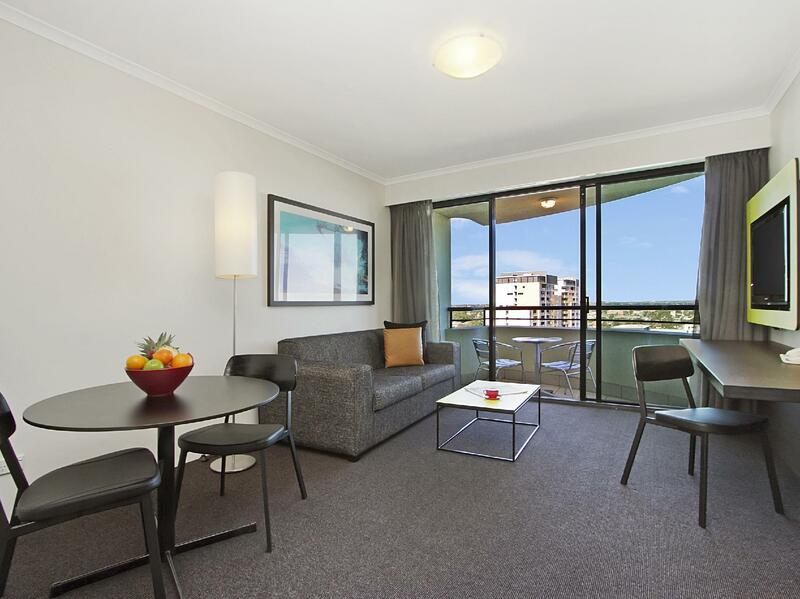 Was very happy with the value, and with the option of parking on site (for a reasonable fee), it was very convenient to then walk to the locations I required in the Parramatta area. Loved having the gym, sauna and steam room - I only wished I'd been there for more of the afternoon I checked in to make more use of them. Would definitely stay again. Fantastic room, very convenient location and excellent customer service . Our spa bath jets were broken and the staff were very quick at moving us to another room with working jets. Would definitely stay here again. Passage way carpets had stains, no toothbrush was provided until I requested. Did not clean my room on the second day until I requested for clean towels and tea. Bed was soft however had this extra layer of mattress which was very hot when sleeping. Swimming pool is freezing cold as it not a heated pool. Location was excellent, 2 mins walk to train and 3 mins walk to shopping Westfield. Very Comfortable and very convinient place for work. The Hotel staff was very good and also the amenities very up to date. We found the staff very welcoming upon our arrival after a long drive. The room was clean and comfortable. We enjoyed the location ... good eateries within a short walk. Similarly, the short walk to the ferry was a pleasant start to a day trip to Circular Quay and environs. Check-in process was quick and no issues. The size of the rooms were fantastic and it was very clean. The staff were very attentive but one issue was the lack of toiletries. There was only one washer in the bathroom for two people. They had a pool and a gym but we did not get to use it. Buffet breakfast was great, especially their hash browns and they had a lot of variety as well. Check out was quick and efficient but we were a little perturbed about paying $15 for parking overnight. I am sure this can be reduced in the future. Overall, we felt at home here and will be returning to this hotel again. It is close to big shopping mall which is good buying stuff. Though it is not close to the city, but with frequent train to arrive the city centre from 30min to 40min which is acceptable. We also took a ferry from there to the city centre which is very nice and recommended if you have time. The room is larger than expected with a quite neighborhood. Stay was Good. But the Car park was bit unexpected and the staff didn't provide good instructions on how to access the car park. Had to few times to the reception to open the gate for me. One other customer was reversing the car from the gate as he had no clear instructions about the access. Staff were happy to help and very polite.. can hear a little noise from the trains, but that's understandable. Westfield parramatra is about the same distance as the train station.. would stay again if I attend another concert..